Delivery Notice: One Perfectly Healthy Boston Hiking Guide. Author and book are doing well! 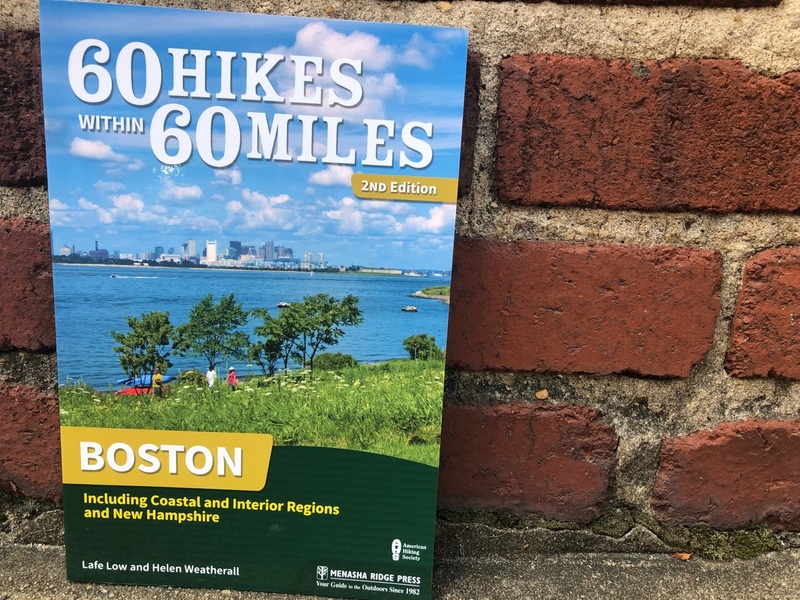 My copies of 60 Hikes Within 60 Miles: Boston arrived the other day. That was certainly cause for celebration, especially when I cracked it open and saw how great it looks. I have written other books for Menasha Ridge Press—four editions of Best Tent Camping: New England and Best Hikes on the Appalachian Trail: New England. The new Boston guide is the best looking child-I mean, book, by far. The pages are color and the paper stock is nice and heavy, which makes the maps and images look great. I am not trying to sell more copies of the book here—honestly, I’m not. I am sincerely sending compliments to the production crew. They did a truly great job. The editorial staff as well. They went through the manuscript with a fine-toothed comb. Thankfully, they didn’t find too many “oops” thanks to yours truly, but they did find one item that caused a bit of head scratching. One of the tasks of revising a book—whether the campground books or the hiking guides—is clearly to update all the existing information. To freshen things up, I also take out five old hikes and replace them with five new ones. One of the new hikes was Spectacle Island, out in the Boston Harbor Islands. A shot from Spectacle Island actually graces the cover of the book. Anyway, where I am describing the driving directions and parking situation for Spectacle Island, it was obviously a bit different. It’s an island. You can neither drive nor park there. After describing where to pick up the ferry, and a bit about the ferry schedules and fees, I opted to slip in a bit of a joke. In parentheses, I added, “If you do decide to drive there, please roll up your windows.” The eagle-eyed copy editor added a note in the first round of edits, “Why?” Ah, copy editors. That response cracked me up even more than putting in the original joke. I can’t take full credit for that joke though. I purloined that from a t-shirt my brother Stefan Low once had as a kid. We grew up on the coast of Connecticut, and sailed to Block Island every now and then. He had a t-shirt that depicted a road going straight into ocean. In the distance, you could see a silhouette of the Block. A sign posted at the shore read, “Block Island: 7 miles. Please roll up your windows.” That always cracked me up—still does. Anyway, it’s good to have my copy of 60 Hikes Within 60 Miles: Boston in hand. Thanks to all my friends who have ordered it. And thanks to my hiking companions Devin Low, Ashley Squires, Lisa Marshall, Scott Schultz, Jason and Liam Howell, Beth Phillips, Peter Tamposi, Mark Grundstrom, and Brian Merritt. It was a pleasure sharing some of these hikes with you. And speaking of selling books, a new book means book signings. Keep an eye out for notification of book signings coming up in the Boston area: maybe some REI store, possibly a Barnes and Noble, the Harvard Coop, maybe an Irish pub or two. You just never know. If you want to look back on what it took to make this book into what it is today, you can read all my Boston blog posts here.